This blew the proverbial cork off the industry's bottle because the Gouais was considered such an inferior specimen that there were even attempts to ban its cultivation in France during the Middle Ages. This proves that humble origins can still produce superior quality. More practically, though, knowledge of their heritage allows improved breeding of highly desirable subspecies of grape. And viticulturists everywhere had DNA fingerprinting technology to thank. DNA fingerprinting is a term that has been bandied about in the popular media for many years, largely due to its power to condemn and save, but what does it involve? In short, it is a technique for determining the likelihood that genetic material came from a particular individual or group. 99% of human DNA is identical between individuals, but the 1% that differs enables scientists to distinguish identity. In the case of the grapes, scientists compared the similarities between different species and were able to piece together parent subspecies that could have contributed to the present prize-winning varieties. The DNA alphabet is made up of four building blocks - A, C, T and G, called base pairs, which are linked together in long chains to spell out the genetic words, or genes, which tell our cells what to do. The order in which these 4 DNA letters are used determines the meaning (function) of the words, or genes, that they spell. But not all of our DNA contains useful information; in fact a large amount is said to be "non-coding" or "junk" DNA which is not translated into useful proteins. Changes often crop up within these regions of junk DNA because they make no contribution to the health or survival of the organism. But compare the situation if a change occurs within an essential gene, preventing it from working properly; the organism will be strongly disadvantaged and probably not survive, effectively removing that altered gene from the population. 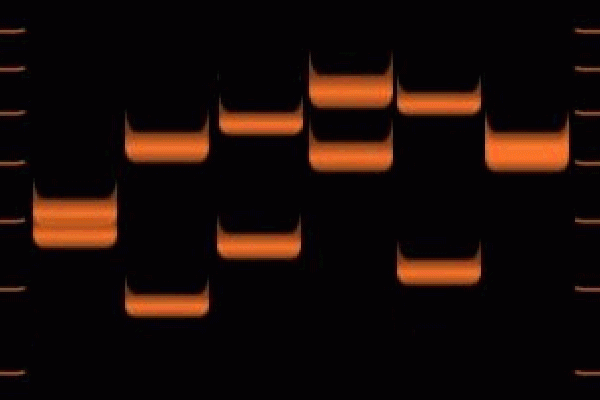 Left - DNA fingerprints from 6 different people, 1 in each lane (column). DNA can be cut into shorter pieces by enzymes called "restriction endonucleases". The pieces of DNA can then be separated according to their size on a gel. Each piece of DNA forms a band (the white lines on the gel). The smallest pieces travel the furthest and are therefore closest to the bottom of the gel. The larger pieces travel shorter distances and are closer to the top. For this reason, random variations crop up in the non-coding (junk) DNA sequences as often as once in every 200 DNA letters. DNA fingerprinting takes advantage of these changes and creates a visible pattern of the differences to assess similarity. Stretches of DNA can be separated from each other by cutting them up at these points of differences or by amplifying the highly variable pieces. 'Bands' of DNA are generated; the number of bands and their sizes give a unique profile of the DNA from whence it derived. The more genetic similarity between a person - or grape - the more similar the banding patterns will be, and the higher the probability that they are identical. In the non-coding regions of the genome, sequences of DNA are frequently repeated giving rise to so-called VNTRs - variable number tandem repeats. The number of repeats varies between different people and can be used to produce their genetic fingerprint. In the simple example shown above, person A has only 4 repeats whilst person B has 7. When their DNA is cut with the restriction enzyme Eco RI, which cuts the DNA at either end of the repeated sequence (in this example), the DNA fragment produced by B is nearly twice as big as the piece from A, as shown when the DNA is run on a gel (right). The lane marked M contains marker pieces of DNA that help us to determine the sizes. If lots of pieces of DNA are analysed in this way, a 'fingerprint' comprising DNA fragments of different sizes, unique to every individual, emerges. But why bother? After all, I know where my wine comes from - Tesco's, right? Well, there are many relevant applications of DNA fingerprinting technology in the modern world, and these fall into three main categories: To find out where we came from, discover what we are doing at the present, and to predict where we are going. In terms of where we came from, DNA fingerprinting is commonly used to probe our heredity. Since people inherit the arrangement of their base pairs from their parents, comparing the banding patterns of a child and the alleged parent generates a probability of relatedness; if the two patterns are similar enough (taking into account that only half the DNA is inherited from each parent), then they are probably family. However, DNA fingerprinting cannot discriminate between identical twins since their banding patterns are the same. In paternity suits involving identical twins - and yes, there have been such cases - if neither brother has an alibi to prove that he could not have impregnated the mother, the courts have been known to force them to split child care costs. Thankfully there are other, less "Jerry Springer-esque", applications that teach us about our origins. When used alongside more traditional sociological methodologies, DNA fingerprinting can be used to analyse patterns of migration and claims of ethnicity. DNA Fingerprinting can also tell us about present-day situations. Perhaps best known is the use of DNA fingerprinting in forensic medicine. DNA samples gathered at a crime scene can be compared with the DNA of a suspect to show whether or not he or she was present. Databases of DNA fingerprints are only available from known offenders, so it isn't yet possible to fingerprint the DNA from a crime scene and then pull out names of probable matches from the general public. But, in the future, this may happen if DNA fingerprints replace more traditional and forgeable forms of identification. In a real case, trading standards agents found that 25% of caviar is bulked up with roe from different categories, the high class equivalent of cheating the consumer by not filling the metaphorical pint glass all the way up to the top. DNA fingerprinting confirmed that the 'suspect' (inferior) caviar was present at the crime scene. In the example shown on the left, DNA collected at the scene of a crime is compared with DNA samples collected from 4 possible suspects. The DNA has been cut up into smaller pieces which are separated on a gel. The fragments from suspect 3 match those left at the scene of the crime, betraying the guilty party. Finally, genetic fingerprinting can help us to predict our future health. DNA fingerprinting is often used to track down the genetic basis of inherited diseases. If a particular pattern turns up time and time again in different patients, scientists can narrow down which gene(s), or at least which stretch(es) of DNA, might be involved. Since knowing the genes involved in disease susceptibility gives clues about the underlying physiology of the disorder, genetic fingerprinting aids in developing therapies. Pre-natally, it can also be used to screen parents and foetuses for the presence of inherited abnormalities, such as Huntington's disease or muscular dystrophy, so appropriate advice can be given and precautions taken as needed. Acknowledgement: This article was co-authored with Dr Chris Smith, who also compiled the images. Previous Does Pregnancy Make You Smell More ?